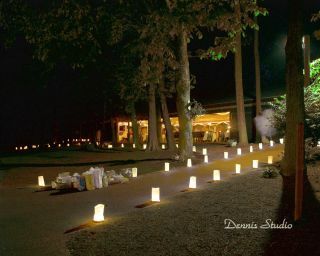 Luminarias (also called luminaries) are a beautiful handmade detail for your wedding ceremony or reception, and are incredibly easy and affordable to make. 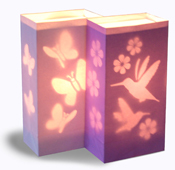 You need only a few basic craft supplies to create customized glowing paper beauties that will add that special something to your wedding day decor. 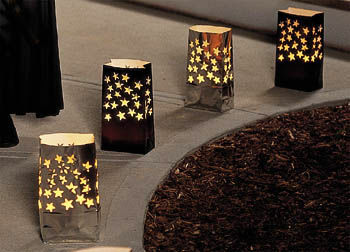 Once you have decided on a design for your luminarias (google luminarias or luminaries on google images to get a great selection of ideas! ), you will need to decide on the method you will need to transfer the design. There are two basic ways – perforation with a thumb tack or actually cutting the design out with a craft knife. 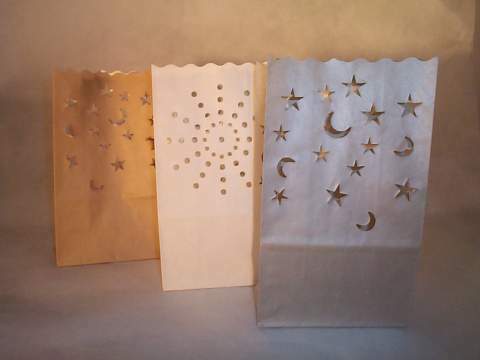 Perforation – Perforating your bags with a thumbtack will allow bright pinpricks of light to shine through in the pattern of whichever design you choose. Place several layers of folded paper on a cutting board. Tape the paper bag (with bottom flap unfolded) to the newspaper with masking tape or any other removable tape. 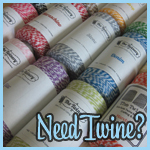 If you have a pattern you have printed or drawn that you are going to be using to create your bag(s), gently tape it into place over the bag so the design is centered. Take your thumbtack and prick evenly spaced holes along the outside of the design, making sure to poke all the way through to the other side of the bag. Cutting Out – Cutting your design out of the bag with a craft knife has both pros and cons. The larger holes will allow much more light to shine through, so the designs will be more apparent..however, the larger holes also allow more wind to come through which may blow out your candle. This may be where the battery operated tea lights have an advantage! Make sure the designs you choose are no larger than 1 1/2″ as designs that are too large can cause the bag to distort and sag. As above, place several layers of folded newspaper on a cutting board and tape your bag (bottom unfolded) to the paper with masking/removable tape. Very gently draw or trace the design you chose onto the bag. 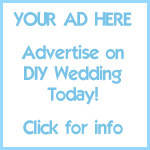 Using your craft knife, cut out your design! Once you have created your design all that is left is to light your bags up! If you are using the bags outside, fill a bit of sand in the bottom of each to weigh the bag down. If you don’t thing the bags will blow around, you can omit the sand. 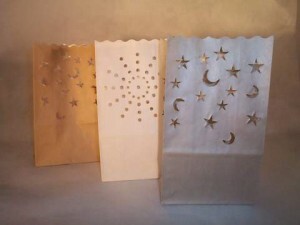 Then add your votive or tea light to each bag and you’re all set! Both methods will successfully create gorgeous glowing luminarias to decorate your ceremony or reception venue. There are so many different color combinations that can be used for the bags, and an endless amount of designs..the sky is the limit with customization for your wedding! Cookie cutters can create great designs! Simply trace them over your bags and perforate/cut away! Think butterflies, flowers, hearts..stars and more! Using two different colored bags per luminaria/luminary can further customize your bags to your wedding theme. Cutting a small design in one area in one color bag, and then another design in another area of another colored bag will allow the opposite color to show through when one bag is placed inside the other and lit. Cherry blossoms are a beautiful sign of spring across the US. The problem with cherry blossoms is that’s the only time you can briefly enjoy their beauty! This makes it hard for anyone who wants them for their wedding in say..December. 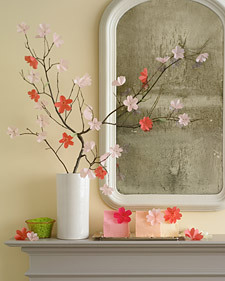 I found a solution to that problem with do-it-yourself blooming cherry blossom branches that would be absolutely perfect for centerpieces and decor! 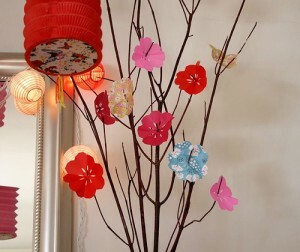 These flowering branches are also extremely affordable, since they consist of branches cut from your yard (or a friends!) and some vellum paper. What’s also neat is you can put your own twist on the blossoms, possibly coordinating the colors from the usual pink and white to colors of your wedding! Whether you want to create traditional blossoming branches, or change it up a bit with unique colored blooms..here are the instructions! Next is to create the blooms! Start by cutting your vellum paper into 3.5 inch and 4.5 inch squares. Each square is folded into a flat cone, following the image below. Use scissors to make four angled cuts to remove the top of the cone. With your utility/craft knife, carve out a small rectangular sliver on each side of the cone(s). Snip off a tiny bit of the pointed tip of the cone, and unfold and shape the paper to create a blossom. Take your branches and gently poke blossoms onto the branch tips. 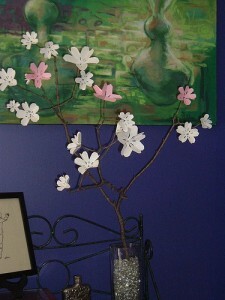 You can add a little bit of glue to each blossom to make the blooms a bit more secure on the branch. That’s it! Now all you need to do is find a pretty vase or container and anchor the branch(es) inside it with pebbles, crystals or stones. Whether you use these branches on every table for a centerpiece, or here and there around your ceremony/reception venue..your guests will be impressed by their beauty. They’ll be even more impressed to know you created them yourself!! Also, if you love the look of the blossoms, but don’t want to attach them to branches, there are a couple other ways you can incorporate them into your big day. I thought it could look really beautiful to gently thread your blooms through colored ribbons or string and hang them from the ceiling. It would be like the gorgeous raining orchids seen in a lot of celeb weddings..only with your adorable (gorgeous!) 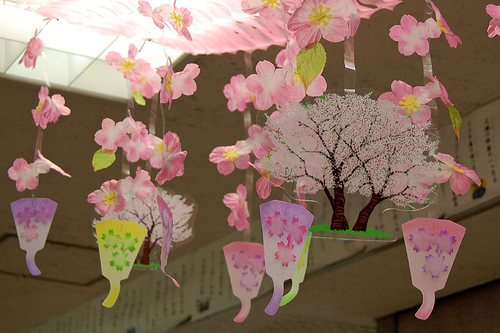 handmade cherry blossoms. Another idea would be using the blossoms to decorate your favors! 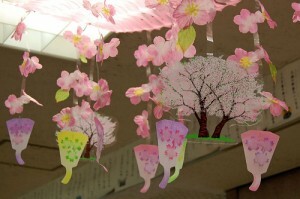 Using a hole punch, punch a hole in one folded corner of the blossom, insert a brad and thread with string or ribbon. Attach to your favor bag, tin..basket..whatever you like! Lastly, and probably most simply..scatter your little blossoms around tables for an additional wedding decor detail guests will love.